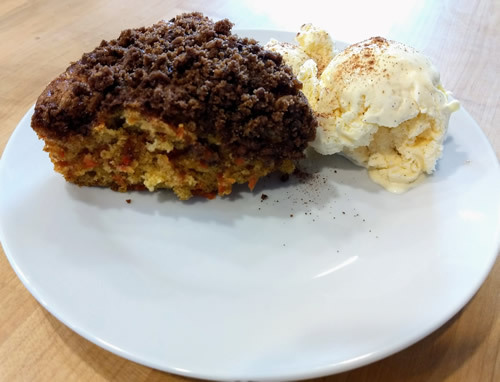 Today is both Ice Cream for Breakfast Day, and Carrot Cake Day, so obviously we had to celebrate both. Ice Cream for Breakfast Day, according to Wikipedia (which as we all know is the absolute *epitome* of factual accuracy, cough cough), was invented in the 1960’s by an exasperated mother. I have a sneaky feeling that Ice Cream for Breakfast Day was actually invented a lot earlier than that, (in fact I’m pretty sure it came into being the morning after the invention of ice cream in the first place), but the formal designation of it as a National Day is a more recent thing, if only because the ability to submit weird and wacky food-related days via the internet to a gathering house sort of website wasn’t around back when ice cream magically popped into being. Think what all those ancients were missing out on. I like ice cream, obviously, but I am ambivalent about carrot cake. On the one hand, it’s usually a lovely, moist cake and there is usually cream cheese frosting involved. On the other hand, it is far too often used as a vehicle for raisins, which are a horrible thing to do to a grape and are therefore Not Food. Luckily if I’m making it myself, I can avoid the Not Food parts of the recipe. Ah, the power of being a home baker. I admit I did go Googling for recipes for carrot cake ice cream (and trust me, there’s quite a few out there) but then I got to thinking about how ice cream by itself isn’t a very filling breakfast, and cake would be a much better option, and also there’s still vanilla bean ice cream in the freezer so I really didn’t need to be making *more*…all of which is to say that this morning, we started the day with some vanilla bean ice cream and a slice of this Carrot Cake Coffee Cake, which covered both bases. The recipe calls for 2 cups of shredded carrots. Therefore one serving totally counts as a serving of vegetables for the day. Yum.